Every time I drink Chianti I kind of feel like Hannibal Lecter. Especially since I'm usually eating it with a nice side of fava beans. 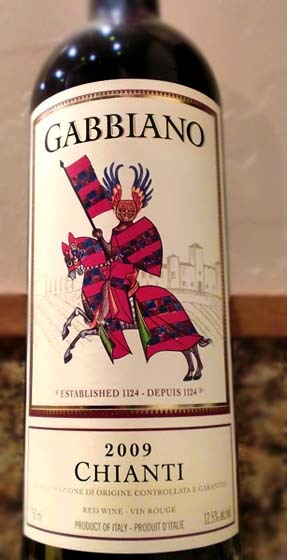 This is Castello di Gabbiano's entry-level Chianti at only around $6-7 a bottle. They make a few others, with the price going up several dollars each step, which actually is pretty reasonable all things considered. The Gabbiano Chianti is 90% Sangiovese and 10% other red grapes. I won't go into the rules behind what can be considered Chianti, but I already wrote about it last year sometime if you want to search for it. It's nothing overly exciting yet I feel more knowledge is always a good thing. So, let's get to it. The 2009 Gabbiano Chianti pours a medium-dark ruby red. I get quite a bit of cherry aromas with some damp earthiness hiding in there. Tasting brings a light-bodied, thin bit of smooth red cherries, a bit of nondescript spice, followed by more of that damp musty earthiness and a smooth, short finish. This is pretty straightforward as far as Chiantis go. It's cherry-centric and light. The slight earthiness does add a bit of depth but that's about the extent of flavors here. All in all, drinkable and decent for the price, and it can certainly be a good weeknight pairing for pizza or something similar. Drink This: if you want a cheap way to feel like Hannibal Lecter. But seriously, this wine isn't bad for the price, although it is a bit too simple and straightforward compared to a few similarly priced Chiantis. Don't Drink This: if you can spare a few more bucks and buy their Gabbiano Chianti Classico Riserva which I find quite a bit better.